Wheatgrass is prepared from the cotyledons of the common wheat plant. It is a green plant similar to grass. It could be sold either as a juice or powder concentrate. Wheat grass contains no wheat gluten. Wheat grass juice is commonly found in juice bars, mixed along with vegetables or fruits. You could also buy wheat grass seeds and grow it yourself in your own home. Wheat grass provides chlorophyll, amino acids, minerals, vitamins, and enzymes. 1 oz of wheat grass juice contains 860 mg of protein, 120 IU of Beta-carotene, 880 mcg of Vitamin E, 1 mg of Vitamin C, 0.30 mcg of Vitamin B12, 21 mg of phosphorus, 8mg of Magnesium, 7.2 mg of Calcium, 0.66 mg of Iron and 42 mg of Potassium. And that’s only in 1 oz! Apigenin from wheatgrass may also have anti-inflammatory properties, according to experts at Memorial Sloan-Kettering Cancer Center, who attribute this to apigenin, which can prevent certain types of immune cells from attaching to the lining of blood vessels. A study published in the August 2007 issue of ”Nutrition and Cancer” found that subjects undergoing chemotherapy for breast cancer who consumed wheat grass juice had fewer inflammatory reactions to the treatment compared to a control group. Subjects with ulcerative colitis, an inflammatory condition, also had improved symptoms after taking the juice, according to a paper in the “Scandanavian Journal of Gastroenterology” in 2002, but these potentially significant anti-inflammatory benefits still need confirmation in subjects taking wheat grass tablets instead of juice. Alot of wheatgrass tablets may have a trace of gluten and wheat, it is best to read the information on the label before buying since those ingredients are most likely found in the tablets. you can also find vitamin B, Calcium , Potassium and Folic acid. These ingredients are beneficial because of they are considered to be antioxidants which is a natural detox. Another great benefit that is found in wheat grass as well as in the supplement is that the actual plant contains a high amount of Vitamin A, Vitamin C, Vitamin E and betacarotene which is beneficial to different parts of the body. Wheatgrass is produced from a seed which sprouts into a long grass plant. Medicine has been made up from the different parts of the plant such areas including the roots and the top part called the rhizome. Wheatgrass is primarily used as a concentrated source of nutrients. It contains vitamin A,vitamin C, and vitamin E, iron, calcium, magnesium, and amino acids. Wheatgrass is used to treat many conditions, but so far there isn’t enough scientific evidence to support effectiveness for any of these uses. Wheatgrass is used for increasing production of hemoglobin, the chemical in red blood cells that carries oxygen, improving blood sugar disorders. Such disorders are diabetes, preventing tooth decay, improving wound healing, and preventing bacterial infections. It is also used for removing deposits of drugs, heavy metals, and cancer causing agents from the body and for removing toxins from the liver and blood. Some people use wheatgrass for preventing gray hair, reducing high blood pressure, improving digestion, and lowering cholesterol by blocking its absorption. Wheatgrass is also used to treat various disorders of the urinary tract, including infection of the bladder, urethra, and prostate; benign prostatic hypertrophy (BPH);kidney stones; and in “irrigation therapy,” the use of a mild diuretic along with lots of fluids to increase urine flow. Other uses include treatment of respiratory tract complaints, including the common cold, cough, bronchitis, fever, and sore throat. There is also a tendency for wheatgrass to be used toward infection, gout, liver disorders, ulcerative colitis, joint pain, and chronic skin problems. Wheatgrass is used for cancer and arthritis in alternative treatment programs. Wheatgrass contains a lot of chlorophyll, the chemical in plants that makes them green and also allows them to make energy from sunlight through photosynthesis. Some people think chlorophyll might fight cancer and arthritis. Wheatgrass juice is a popular health drink. It is thought to benefit health only when fresh and taken on an empty stomach immediately after extraction. But there is no research to date that supports this. In foods and beverages, wheatgrass extracts are used as a flavoring component. Blood disorder called beta-thalassemia. Early research suggests that drinking wheatgrass juice daily for 18 months can reduce the need for blood transfusions in children with a blood disorder called beta-thalassemia. Inflammatory bowel disease (ulcerative colitis). There is some evidence that freshly extracted wheatgrass juice might reduce overall disease activity and the severity of rectal bleeding in people with ulcerative colitis. If you opt to drink wheatgrass juice, start with 1 oz. per day and gradually increase it to between 2 and 4 oz. each day or every other day, Dogwood Gardens advises. Drink it in small quantities throughout the day on an empty stomach, either two hours after eating or 30 minutes before. If you apply wheatgrass as a topical application, Dogwood Gardens says to rub the pulp directly on your skin. It does not specify how frequently or for how long a duration. Wheatgrass contains an antioxidant compound called apigenin that may help protect your cells from oxidation by free radicals, which form in your skin when you’re in sunlight or in your organs after exposure to environmental toxins. Over time, free radicals can oxidize and damage cellular membranes and DNA, raising your risk of cancer and other disorders. Research published in the June 2010 issue of “Pharmaceutical Research” reports that a diet rich in antioxidant apigenin may be related to decreased risk of breast, digestive, skin and prostate cancer, and some cancers of the blood. The authors of a review published in the January 2007 issue of “International Journal of Oncology” conclude that apigenin-rich foods such as wheatgrass have potential as cancer chemopreventives, but clinical research is needed to confirm this. Wheatgrass is generally safe, the Mayo Clinic says, although consuming it sometimes comes with some side effects. These include hives, headaches, swollen throat and nausea. Avoid wheatgrass altogether if you are breastfeeding or pregnant, and check with your doctor before consuming wheatgrass if you are allergic to wheat or grass, are intolerant of gluten or have celiac disease. Also keep in mind that wheatgrass, or any herbal remedy, should not be used as a cure-all or in place of a medical treatment plan advised by your doctor. Wheat grass is generally safe, however there may be some side effects. Wheatgrass as been associated with headaches. 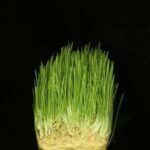 This can occur when the wheat grass may be contaminated with mold. To avoid this, make sure to thoroughly wash the wheat grass before ingestion. The detoxification effects of wheat grass may cause headaches, nausea, diarrhea, coughing, skin eruptions, nasal congestion, mild fever, and malaise. Although wheatgrass is wheat gluten free, people that are extremely sensitive to allergic to wheat should not consume wheat gross. This could result in an allergic reaction of hives, swollen throat or swollen face. ” Hippocrates Health Institute. Hippocrates Heath Institute, 2013. Web. 28 May 2013. “Side Effects of Wheatgrass.”Moore, Shelly.LIVESTRONG.COM. N.p., 20 Mar. 2011. Web. 28 May 2013.